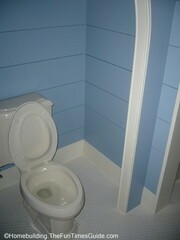 The water closet in the upstairs bathroom of the newly constructed English cottage-style home that I visited recently is unique, to say the least. “Expect the unexpected.” A mantra easily applied to this extraordinarily built English cottage. I’ve heard many people refer to a toilet as a “throne”. That term could easily be applied to this water closet and the lavatory in which it was built. 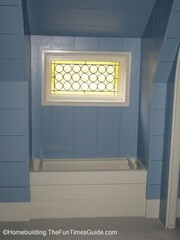 The bathroom is flooded with natural light via the rondel glass window. A rondel glass window such as this is a much better choice than this example for a couple of reasons. It’s architecturally appealing and provides the privacy desired. 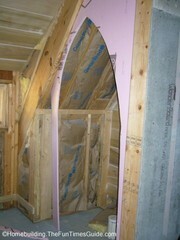 A gothic arch entry to a water closet certainly makes your bathroom visit much more interesting than your standard 6 panel door. If you’ve got a bathroom remodel on your calendar and can fit this style of water closet entry into your home, I say go for it. It’s a heck of an idea!